Stir Fried Beef with Broccoli is more popular in America than that of in China. Maybe it is because the two materials are the most popular foods in America. In China two dishes are more popular: Beef Oyster and Broccoli In Broth. Beef is fragrance, tender and smooth while broccoli is fresh and crispy. This dish is suitable for those who are weak and tired. You can use more broccoli than that of beef, but not more than two times. Otherwise the dish may become tasteless. The professional way is to blanch broccoli in advance then stir fry in beef. 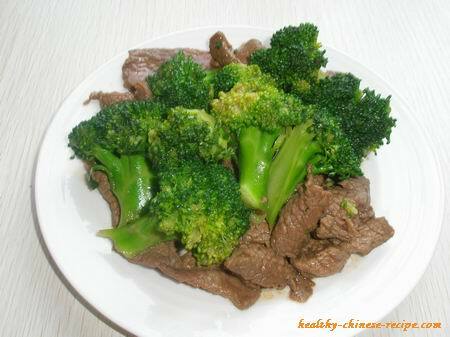 For home making, you can directly stir fry broccoli till cooked, then put back cooked beef. It's easy and the broccoli is more delicious. However, blanch is a healthy way. b. Keep beef and broccoli dry when putting them in a wok. This will avoid extra water to destroy the flavor of the dish. Mix in Marinade by this order: rice wine, soy sauce, cornstarch, oil. Store in fridge for 15 minutes. 2. Wash broccoli, cut into bite size. Put in boiling water. Add 1 teaspoon cooking oil and pinch salt. Take out by using a sieve. Drain well. 3. Heat oil in a wok. When the oil is 30% cooked, slip in beef slices. Quickly stir fry till color turns to white. 4. Add Seasoning, stir fry several times. Add broccoli, stir fry and mix well. Add Sauce, quickly stir fry till thicken and well coated. 1. I didn't use oyster sauce as it contains MSG. 2. If you like heavy sauce, you can replace pinch salt with 1 tablespoon oyster sauce or hoisin sauce. 3. Professional way of Beef with Broccoli is to take out beef and put back in step 3. It needs more cooking oil. But we don't need to do that at home. We just do it easy and healthy.